And so the shuffling began. 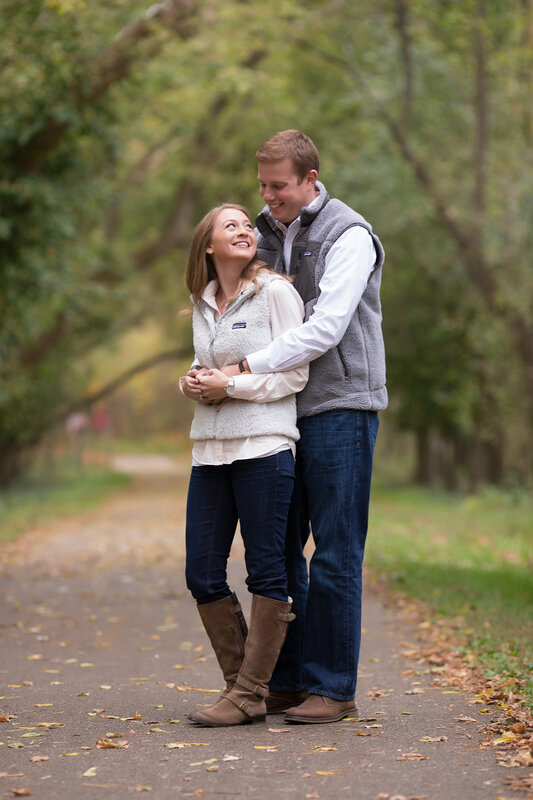 Managing wedding planning and surgery, and then recovering, while still wedding planning. So we celebrated for two weeks, and then got into surgery mode. Looking back it all went so fast that I'm not sure I realized the full extent of life's craziness until now, but I'd do it all over again. What better of a time to be surrounded by friends, family and supporters? So what did I learn from this process? That's the important part. There were many lessons I stumbled upon through the course of being the engaged double mastectomy girl (still am, so keep 'em coming), and this is one of those posts I hope some awesome chick out there either contemplating or going through a preventative surgery like mine can find and take comfort in. Because your engagement is supposed to be fun! And it totally is, even if you're going through a trying time. And it also goes for those that may not have a significant other in their lives yet and worry about having the surgery before finding love. I want to guarantee you there are men out there who will love you, scars and all, and planning your future wedding will be a piece of cake after you've conquered your high-risk. No one needs to know, or can tell from the outside, unless you want them to I am a prime example of this. You would be surprised that after going through an 8+ hour surgery, a night in the hospital and having horrible drains in you for a week, after week two or three of recovery, no one can really tell by looking at you on the outside. The first wedding venues I looked at, I went to during my initial recovery. I got myself together, put on some makeup, straightened my hair, and no one would have ever known what I was going through. It was a confidence booster for me. To get out and about and be "the bride" looking at venues, with the wedding coordinators not having a clue. I just want women to know that. It's not a scarlet letter you're wearing on your chest. You're still the same chick, in my case engaged chick, that you were before. Don't let your surgery, your recovery, the scars, anything define you. Because at the end of the day, you're still you and a little self-pride can do you well. People in the wedding industry have seen it all This is phenomenal to me! I was so, so fortunate to have two of my awesome friends Grace and Anne make me an appointment at KLEINFELD'S in NYC while I was in the city for a trip earlier this summer. I mean, going to Kleinfeld's is every engaged chick's dream. And here I was living it! Aside from the hilariousness of the place itself, the crazy women inside and the extreme amount of bridal gowns everywhere, what I took away from this experience was how unfazed they were at my current situation. Before we began the process of picking gowns for me to try on, I awkwardly spoke up and said "Umm there's something I think I should tell you." The woman working with us looked at me and said, "Honey, that doesn't bother me one bit, I've seen it all." And seriously acted like I was the crazy one for thinking it was a big deal. Her and her assistant put me in and out of dresses like I was any other woman in there, and that made me feel so at ease. It was the weekend before my "exchange" surgery, so my expanders were at their fullest, AKA most uncomfortable, stage, yet these women put me in dresses and made me feel completely beautiful. It didn't matter what I was going through on the inside; I was a beautiful bride-to-be that day. Remember why you're engaged, and don't ever stop celebrating that Engagement is about the love between the two of you. Not just you. Not just him. And this was something I had to remind myself. I was the one having the dramatic few months, with hospitals and attention, but the engagement and wedding planning process helped me remember why I deserved some extra positivity even through the pain and hard days. We're getting married! We're planning what will be the best day and night of our lives! And that is worth celebrating every day, whether you're in pain from the expanders or not. Having my wedding to plan and look forward to 100% got me through my recovery. Sure, planning a wedding comes with a bit of drama and tough decisions, but at the end of the day, I'm the luckiest girl in the world and I had Kevin by my side to celebrate every day. I am so blessed to have the next six months to continue celebrating my engagement, future wedding and the life we have to look forward to. I may be that chick who had the double mastectomy right now, but at the end of the day, I'm still just thrilled to be Kevin's fiancé . Deciding that louder awareness is greater than quiet praise, and why I don't read the comments. Let's start with this: I know I put myself and my story out there. I 100% acknowledge that I, very willingly, shared with media outlets big and small my decision to have preventative surgery and my journey since. Now, since I've made that clear, I also 100% acknowledge that there are some real crazies out there. And especially when you are dealing with the Internet. I decided to write about this topic of sharing your story, the media that shares it and what you can do to move beyond negativity because I think it is really relevant to anyone who feels passionate for a cause and wants to shout it from the rooftops, rather than sit quietly. And when it comes down to it, it's up to asking yourself one question: is the attention and awareness you're spreading bigger than the (sometimes ignorant and negative) crazies in the world? For me, the answer is astoundingly no short of "hell yes." From the moment I posted my first blog, I was overwhelmed by not only gratitude for all the love I was receiving, but also by the extreme amount of confidence I was feeling in myself. Confidence is something I've struggled with in the past, maybe not outwardly, but through different stages in my life, so to feel a new confidence come from within, it was a strangely new feeling that I was immensely proud of. I could have kept quiet, shared it with a few close friends, but deciding to speak out and loudly about my mission has proven to be the best decision I have ever made. Now to the media. The whole joke of the matter is that I work in marketing and advertising and have an educational background in journalism and public relations. So should I have seen all this coming? Yes, and I did. And I absolutely know that by putting your story out there for the world, you open yourself up to criticism. But the tricky part is remembering to have thick skin when people react either negatively or just have differing views and opinions. Because that does happen, and I think always will. It's part of why my story is unique. Not many young women go through a preventative surgery like mine, but that's part of my mission; to spread awareness for something that could save a life, and especially for those that were unaware or in fear of the information I sought out and used to be proactive. I'm fortunate that I have had incredibly supportive people in the media help share my story. My first interview with Sheree from Channel 5 was just wonderful and she was so, so sweet to me through the entire process. Obviously my experience shooting the TV commercial for UC Health was just as wonderful and in such a supportive environment. And by far the most rewarding experience was my quick few minute interview with Lynn Berry from HLN. I ended that Skype interview in such awe of her compassion and just flat out praise for my mission to share my story. So where does any negativity come in? The comments. There are a lot of people out there that have strong opinions and also like to share them from behind their computer screen. And that can be very hard, and I can promise you that I have to force myself not to read too much into them, or read them at all. Someone told me recently, and it was genius, that it's like being a celebrity and knowing they shouldn't read what was said about them in USWeekly. Now, I'm no celeb, but it is totally applicable. Celebrities know that people will find something to be negative about for everything, and it's just not worth it. So do I. It's a balancing act between respecting that everyone has an opinion and it's perfectly acceptable for others to not share yours, and also knowing that it may not be worth causing yourself any pain to always read everything they have to say. So what can you do: Surround yourself by positive people, praise and environments. Embrace those who support you and your mission, whatever it may be. It's those people who will remind you why you're fighting for what you're fighting for, and never let you forget it. Soak in all the accomplishments you receive and applause you collect along the way. Happiness does wonders on the soul. And lastly, put yourself in environments that bring out the best in you. You will not be able to please everyone or gain everyone's support. That's just life. But you can be the best you can be and do the best you can possibly do, in your own world. And sometimes that is enough to fend off any negative vibes. So for me, I'll keep striving to spread awareness for high-risk young women, no matter what a random Internet crazy comments. And for all of you who are passionate for a special cause in your heart, I hope you keep fighting for what you believe in and finding it in yourself and from those who support you, to keep on keepin' on. Because, YOLO: Being Queen Bee for the day! "It's better in life to look back and say 'I can't believe I did that' than to look back and say 'I wish I did that.'" Tomorrow I will be participating in my second half marathon. The Cincinnati Queen Bee is a women-focused half and 4-miler, and tomorrow is the inaugural race. More importantly, tomorrow is MY inaugural race with my new body, and fresh outlook on life. Flash back to spring of 2013 and my first half marathon. It was something myself and a few friends did together and was awesome, but it definitely wasn't easy. (I'm waiting for Maria to read this and text me asking if I've lost my mind!) But let's get real, if I can deal with two surgeries in six months, I can run a few hours on a Saturday morning. Now don't get me wrong, I'm not planning on running the whole thing or breaking any records, and I really haven't had a ton of time to train (physically and in regards to my more-important social calendar) since I've been cleared to get back to regular workouts, so I'll be doing the best I possibly can by run/walking it. Since I was able to start going back to the gym, I've tried my best to make working out more of a fun routine. Dragging friends to the gym at 6 a.m. so we can gossip while stair-stepping, going on walks with a BFF and her dog to Coffee Emporium on Fridays and running outside or at the gym on the treadmill as a way to decompress from a long day while listening to a lot of Mat Kearney. It's been fun, and kept me in pretty good shape. 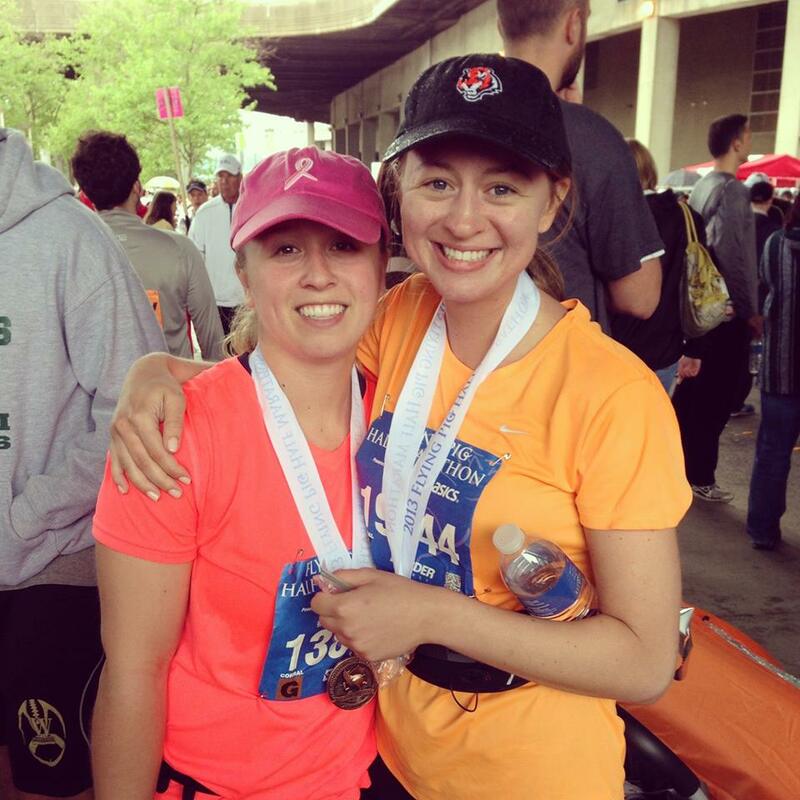 So really, why not take on another half marathon? When it comes down to it, my reason for doing it is both simple and admittedly selfish: to show myself that I can. I want to show myself, and other young women who may be in similar shoes, that the surgical decisions I made in the last year did not take away my ability to stay in shape, be healthy or the possibility of coming out on top. You don't have to bounce back to win triathlons or climb mountains, but having a goal and sticking to it can be as rewarding as the medal at the end of the race. To all the Previvors: today is our day. "Do the best you can until you know better. Then when you know better, do better. " -Maya Angelou It's October 1st, and I think, and hope, you all know by now that this means it's Breast Cancer Awareness Month. Most of you know I'm a diehard Today Show watcher, and as soon as I turned it on this morning I was taken over by pink. Matt's ribbon, Carson transforming the Orange Room into Pink Power city and Joan Lunden as a special guest taking breast cancer questions via Facebook. Pink was awesomely everywhere by 7 a.m. I loved it. 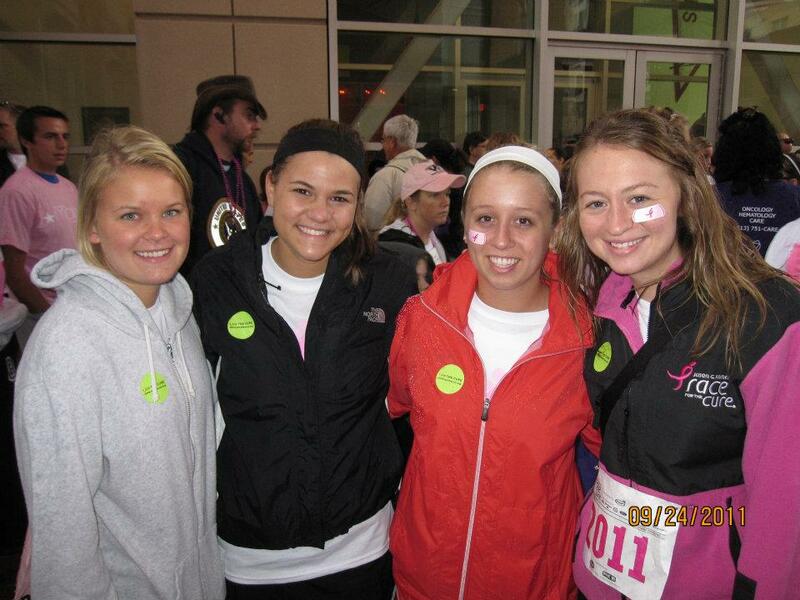 This year, Breast Cancer Awareness Month has a different meaning for me. For my life, breast cancer awareness has turned into educating, sharing and opening the conversation on the breast cancer Previvor (capitalizing because I think we are cool enough to have that title). And guess what, it's not only the beginning of this pink-filled month, today is also National Previvor Day! It may be the lesser-known national day during this month, but it's the one that I hold the most dear. So let's start Breast Cancer Awareness Month with a pink bang, and remember that knowledge is power. Being a Previvor doesn't mean you have to take surgical matters or know right now what you want to do, but is does mean that you're aware of your risk, and you have the power to be proactive and live a healthy lifestyle. For me, being a Previvor means using my knowledge to stay proactive, preventative and most importantly, to be confident enough to share my knowledge and my story with the world. Because helping one person, being a role model to one person or just touching one person's life in some small way, could save a life. So here's to you Previvors, and the courage it takes to have the knowledge of your risk and do all you can to prevent your chances of developing breast cancer. Let's be proud in our fancy name. Today is our day. Because knowledge is power. And having that power is something to be proud of. When I talk about my BRCA genetic mutation, I'm usually referencing the increased risk for breast cancer. While this is the biggest increased risk for BRCA carriers, it's not the only one. 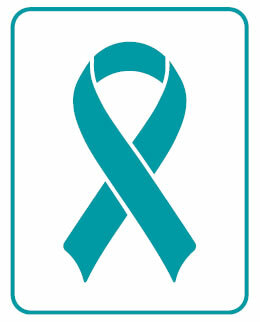 This month is Ovarian Cancer Awareness Month. And because of this, I want to raise awareness about this "silent killer," the risk that BRCA carriers have and what you can do to be proactive with your ovarian health. Ovarian cancer is commonly referred to as a "silent killer" because 60% of diagnosed patients are already in stage 3 at the time of diagnosis. It's different than other cancers, like breast cancer, because there isn't yet a screening process to detect the disease. A common misconception is that your annual appointment with your OBGYN and your annual Pap test is "screening." Unfortunately, there is no effective screening (seems crazy, I know), and although going to your annual appointment is still a smart action plan, there's more to it when it comes to being proactive and self-aware. Now, I know I have a lot of hypochondriac friends out there reading this, so I'm not wanting to freak anyone out by giving out a list of symptoms that can be common in some women (who don't necessarily have anything wrong with them). I'll let WebMD be the one to freak you all out. But, I do think it is extremely important to know these symptoms and identify them in yourself if they last longer than two or three weeks. Because if so, it is recommended you see your medical professional. It could be nothing, but it could be what saves your life. For me, I have a very aggressive and proactive GYN. His plan, that started even before I was engaged, was that I was to start popping out babies as soon as possible, to a) decrease my risk, and b) allow me to seriously consider surgical options like a prophylactic oophorectomy. It's something I know I'll do when the time is right, but again, that's a very personal decision, that comes with a lot of changes in my body that I'll have to deal with (menopause, for one, in my thirties does not sound appealing, but hey, I survived the mastectomy in my twenties). It'll be a family-oriented decision, because believe it or not, in just 8 months, I'll be Molly McKnight, and hopefully down the road I'll be mother Molly McKnight with cute little Irish red head kids, so my decision will take action when it's the right time for my family. The point is, I'm able to make such decisions because I have the knowledge to be proactive if I choose to do so. I'll get off my proactive soapbox and reiterate just one more thing. This disease is the deadliest gynecologic disease that is out there. All women are at risk, and it can attack at any age. So please, be aware and conscious of your body. It can save your life. Please note: I am 100% not a medical professional, so if you want specific medical advice or expertise, go see your doctor. But if you want friendly conversation, or have questions you're not ready to go your doctor with yet, I'm your girl, and will help in whatever way I can. So maybe you're reading my blog because by default, you have to. You're a friend, family member or random Facebook friend that keeps being inundated with The Molly Effect. BUT, for any of you that may have caught wind of my blog because you can relate, know someone who has battled breast cancer or are at high-risk yourself or know a friend or love one that is, this post is for you. Finding out, or deciding you would like to find out, if you're at high-risk for breast cancer can come to you in multiple ways. What I've found is the most common discovery is from young women whose mother, grandmother, aunt, etc. have had breast or ovarian cancer, and are looking at their family history with a bit of worry. While this is common, it's not the only way you can be faced with your high-risk history. For me, it was my dad getting sick, and specifically that they could not find out why or with what. There was a known family history of breast cancer in my family, but it wasn't openly discussed, or at least not when I was younger. But truth be told, once we mapped out the family tree, there were just too many instances of women on my dad's side of the family that had been faced with breast cancer. Everyone's situation is unique, and I'm constantly reminding people that the choice is personal. Just because I saw the high-risk in my family and chose to dig deeper with genetic testing, doesn't mean that's right for everyone. And that is 100% OK. As much of a supporter I am for the decision I made, I would never recommend it to someone who wasn't absolutely sure yet. But if you are sure, and you want to move forward with finding more information about your risk for breast cancer and/or the BRCA genetic mutation, one of the first steps you can take is to meet with a genetic counselor. I'll start by saying my experience was really, really great. I met with an awesome genetic counselor that did a wonderful job of explaining what was a completely unknown thing to me, in a way that made me feel as at ease as possible (when it really could have freaked me out even more). So below is a list of three things I recommend to consider, think about or take with you to your first meeting with a genetic counselor. And if you're not there yet and just want to talk to someone over the phone, or read more about it online in the comfort of your home, I've included some links and contact info as well. It can be a scary thing to take this step, but I can personally say that knowledge is power, no matter what you do with it. Carpe diem, friends! 1. Your family tree Chances are, you do not have a family tree mapped out on a piece of paper at home listing all the members of your family and the ages that they have had cancer, or at least it's not something you refer to often. But here's the thing, that family history can be some serious ammo in your fight for being proactive with your health. Not only will the genetic counselor want to see this to gauge your risk, it's also a triggering point to begin the conversation with family members. Maybe breast cancer is taboo in your family and a subject rather not discussed. Asking your mom, dad, grandma, grandpa, whomever, to sit down with you and chart out the family members before you who have been diagnosed with cancers (not just breast) can lead to more open conversations about your individual risk and the disease itself. This can help if you decide to take more actionable steps later on. 2. Your personal medical history and ancestry If you personally have been diagnosed with breast, ovarian cancer or another form of cancer, this can help navigate your risk for carrying the BRCA gene, along with the knowledge of what, if any, of your relatives have been diagnosed as well. Aside from past cancer diagnoses, there is also a correlation between the genetic mutation and being of Ashkenazi Jewish ancestry. The genetic counselor will want to know this right away to help assess your risk. 3. A support system! This is totally my personal opinion, but I believe that having some type of support system with you during this process can immensely help overall. Whether that be a mom, dad, sibling, boyfriend/girlfriend or supportive friend, don't feel weird if you want to bring someone with you to the meeting. Sometimes it's hard to take in all the information you're given when you're feeling overwhelmed, and it can be nice to have someone else in the room taking notes or listening with a different perspective, while also being there as a support for you. And hey, if you can't think of anyone you'd be able to take, I volunteer to be your supporter. You can do this! Disclaimer: I am obviously not a medical professional, so please, just take my words as suggestions, from personal experience. As always, there are professionals out there that will be a better medical resource, but if I can ever be of any help in your personal journey, I am here to help. I believe that a big part of growing, learning and developing, especially in your twenties, is to acknowledge your faults or things you could do better at, and strive to do so. For me, I'll admit I haven't always been the strongest when it comes to tough times, emotional situations, etc. Even when I outwardly come off as having it together, it doesn't mean I'm not crying to my family members or Kevin in private. With this, a more comical term, "mental toughness" was born. A large number of my friends have probably heard Kevin yell to me, "ESSELL, MENTAL TOUGHNESS!" whether that be directed toward me "trying harder" to make the bus, complaining about it being cold outside or sucking it up and putting my clothes away now, not two days later. In all seriousness, I need Kevin's nagging every now and then. But it wasn't until the last few months where I really learned how to (allow me to toot my own horn) excel at being mentally tough. So for anyone out there that's gearing up for a surgical procedure, going through a tough time or even just struggling with things that right now seem unbearable, I give you the Molly Essell & Kevin McKnight Mental Toughness Bootcamp: Three ways you can get yourself into a tough but positive state & get back to thriving ASAP. Health is not just defined by the number on the scale or cutting out late night pizza every other weekend. I'm no dietician, but I'm self-aware enough to realize how much better I feel when I've been eating healthy and getting in some exercise. This "feel good" sensation carries over to my overall mental well-being as well. I'm a much more positive person when I'm feeling healthy. And in turn, able to tackle hardships that come my way with more of an optimistic outlook. Instead of grabbing the ice cream when you're having a bad day, grab some blueberries and go for a walk. Might sound difficult to do but I guarantee turning on the Summer Hits of the 90s Pandora station and getting some fresh air for 30 minutes will do you some good. Where I used to be more likely to keep problems, angry thoughts, worries in, I now try (and I say try, because I'm not close to perfect yet) to take some time to think about what's bothering me and how I can talk about it. If I'm bothered about a certain person, it's finding a way to articulately form my opinions and discuss with them, instead of internalizing. If I'm bothered by something I did myself, it's talking to a friend about how I can do better, get better or sometimes just move on. If it's something I don't think I can talk about with anyone else, I write it down. Lists can be lifesavers! Get a notebook for your nightstand. Having this idea of addressing the issue, talking (or writing) it out helps me get all the crazy thoughts and ideas out of my head (that let's all admit, come at 2 a.m. and take away all sleep you're desperately trying to get) and instead, feel better after talking it through. So friends, do me a favor this week, and on Sunday, stop the Sunday Scaries by taking out a notebook, writing down your list of things to accomplish on Monday and go to bed early! I will be the first to say, sometimes you have to accept and celebrate small victories. For me, every Monday morning, I wake up to the conversation of, "So are you making the bus?" (For those that aren't aware, I ride the bus from Mt. Lookout to downtown, what is supposed to be, every day. Most days it's me running out of the apartment, barely making it as it flies down Delta.) So every Monday, I get into the goal setting with Kevin, and myself, on how many days I am going to make the bus. For instance, this week my goal is to take it Tuesday-Friday. I'm on my way to a victory and you better believe I'm going to succeed. The point being, it's little achievements like making the bus that give you a sense of success, and confidence. No one is more mentally tough than a confident, I-can-do-it person. Set some goals, remember the confidence you feel when you achieve them and tackle with toughness the next challenge that comes your way. One of the most rewarding aspects of this journey I've been on is feeling that I may be able to impact the lives of women around me, just by sharing my story. Today I simply want to invite you to join me at two upcoming events, specific to the causes that I hold so dear. If you, or someone you know, could benefit from either of these, please pass along the info. It’s my hope that by continuing to share my journey, and the groups and people around me that have helped me along the way, I could help at least one other person. Happy Monday, all! TOMORROW, Tuesday, July 29 at 6 p.m. Bright Pink Cincinnati presents the next experimental outreach event at The Art of Entertaining! Bright Pink is the only national non-profit organization focusing on the prevention and early detection of breast and ovarian cancer in young women, while providing support for high-risk individuals. Sounds pretty awesome, doesn’t it? And what’s even more awesome is that they put on these really cool, free events for high-risk women, and they have just recently started a group in Cincinnati! I personally have been to one of the previous events and can say it really is a special group to be involved with. This event is at The Art of Entertaining and will be an interactive cooking class, along with a time to chat with other young women about being young and at high risk. 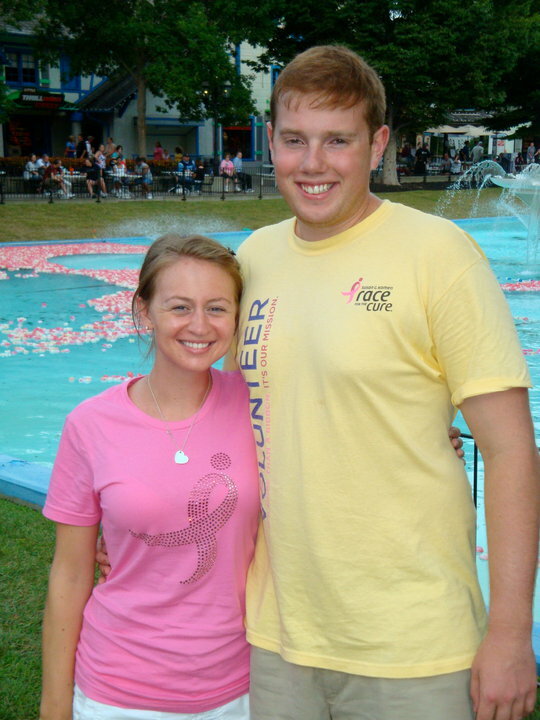 Komen Greater Cincinnati's Young Professionals Committee is a volunteer organization composed of rising young executives and professionals dedicated to our promise to save lives and end breast cancer forever. The YPC's goal is to engage our generation in the culture of philanthropy by developing events and social activities in the Greater Cincinnati community. And this upcoming event at Madtree is sure to be an enjoyable one! It’s apparent in my life every day that breast cancer affects so many people. For me, it’s a cause that I’m personally passionate for and there’s no better way to raise money than by having a good time with friends and drinking some tasty local beer. So, please join me next Saturday, August 9th at Madtree for beers, socializing and supporting the mission of Komen! If you have any questions about either of these events, want more information or just want to chat about getting involved, email me at mollyessell@gmail.com. Life is funny in that we seem to wait for big, sometimes scary, sometimes surprising, changes to come our way to find reasons to celebrate. We’re reminded in times of sorrow, to celebrate life and those we love, and in times of happiness, to celebrate how fortunate we are. In the last week or so, I’ve had many reasons to celebrate many things: life, engagements, birthdays, even goodbyes. Stepping back and thinking about these celebrations makes me realize even more so how much we have to celebrate, on a daily basis. It’s the little things, like Kevin whipping up breakfast for me before work, coffee breaks with my coworkers during a hectic work day, and a long walk catching up with a great friend, that sometimes merit just as much reason to celebrate. My very great friend and roommate of all four years at OU, Rachel, lost her father recently. My heart just hurt for her and her family as they went through this difficult time. What I want to point out, is that I was blown away at his visitation and memorial service. His family and friends celebrated his life in such a beautiful way and showed through their stories how wonderful of a person he was, and the impact he made on so many lives. It made me proud to be Rachel’s friend, seeing her do such a killer job that day, and truly made my heart happy, seeing Marty’s life shining down on all of his children, grandchildren and wife Patty. What a reason to celebrate! Another reason I love celebrating engagements? It brings friends together! To celebrate Claire and Bryce, we got together and spent a day at the lake. Such a fun day, and naturally for us girlfriends, we made it a just-as-fun night out! Hilariously enough, we went to the nearby Hollywood Casino in Lawrenceburg, IN, and had such a funny, fun time! We hung out with Pitbull and Chris Brown impersonators, danced the night away at Boogie Nights and laughed until we cried at how hysterical it all was. Seriously such an awesome night with old and new friends! My last appointment with my plastic surgeon! Once again, it is still surreal to me that all this craziness is near over. I had a freaking double mastectomy three months ago and I’m already able to say goodbye to my plastic surgeon?! Hallelujah! I unfortunately have other reasons to say goodbye to Dr. Nguyen. She accepted a job at the Mayo Clinic in Rochester, MN, and is leaving University of Cincinnati Medical Center. Fortunately for me, she was able to finish me up in a timely manner and leave me in good hands at UCMC if I ever need anything else. 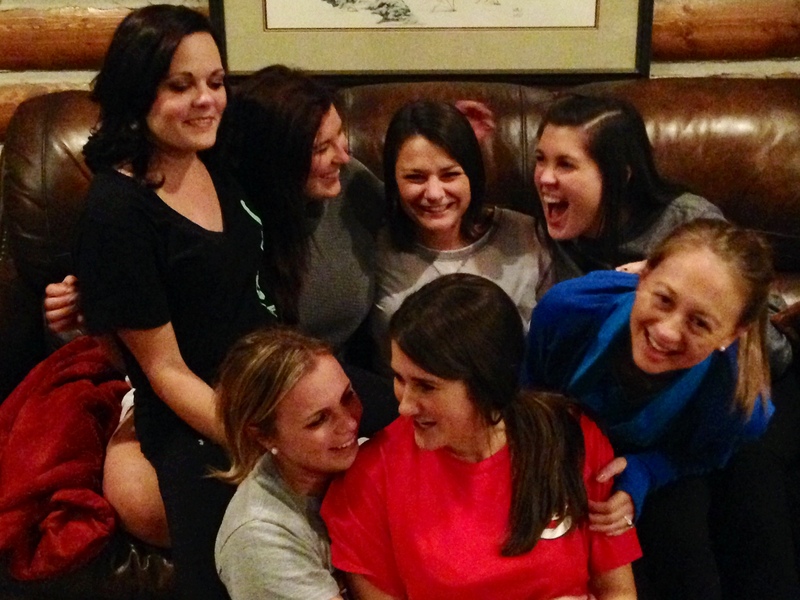 Naturally, my mom snapped a pic of us before we said goodbye forever! And even more naturally, I ended up seeing her walking her dog the very next day as I was making a Bruegger’s coffee run with a coworker. She just can’t get away from me! In all seriousness, she did such a fabulous job and was a tremendous resource for me through all of this and for that I am very thankful. Birthdays! It’s probably my fault that Kevin’s birthday always turns into “birthday week.” I LOVE celebrating birthdays. And here’s the deal, I don’t think he minds one bit. We started the bday week with dinner at his parents’ and enjoyed Kevin’s fave, key lime pie. The rest of the week included lunch at Sleepybee’s with Mare on Monday, followed by a night on the town with me that evening, a surprise dinner with all of our friends (thank you to our peeps who really pulled that off well!) Wednesday and yet another birthday dinner last night at Eli’s with Jenny, Liv & Kyle. He sure was spoiled, and deservedly so! The guy has dealt with a whole lot of sh*t the last few months, AND proposed to me this year, so I think he’s allowed an extra special birthday week. Cheers to many more, K-Dawg! Fourth of July. A holiday celebrated by Americans, to honor our country and those who protect the one thing we all take for granted, our freedom. 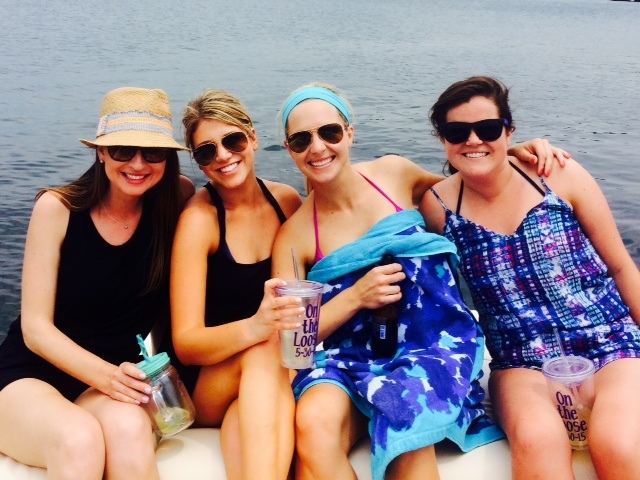 This year, my Fourth was truly about celebrating just that, however for different reasons. This past Monday I strolled back into UCMC, this time with much less anxiety and much more confidence, to undergo my last major surgical part of this journey. They commonly call this procedure the "exchange," in which they remove the expanders in my chest, and replace them with implants. I was in surgery just about two hours and was able to come home that evening. If it sounds simple, it's because it is, when compared to the first part of this process. And if it also sounds awesome because I get a nice set of implants out of this whole ordeal, thank you, I very much agree. So after an afternoon in the hospital, I was able to leave with the freedom of my expanders being gone forever. In a nut shell, expanders feel like rock-solid bricks. Now think about having bricks in your chest for a few months, and their sole job in your body is to physically expand your skin. Doesn't sound very pleasant, does it? Needless to say, freedom from those bad boys was enough reason to celebrate itself. And to top that, I have an even greater reason to celebrate: the freedom from this surgical stage of my life! With the exception of a planned trip to meet with a world-renowned tattoo artist in January, I am done. As I'm typing this I'm realizing I probably haven't even let that sink in yet. It's really almost done. Months of in and out of recovery, awkwardly-fitting outfits and lack of upper body workouts are finally coming to and end. What word is more fitting than freedom? Tomorrow I go back to work, after a week of recovering and resting, and can have the peace of mind that I've successfully completed such a huge step. Now, I still have miles of recovery ahead, considering I can't lift anything over 10 pounds and am still having to use my stomach muscles to pull me out of bed, but that's all okay. The light at the end of the tunnel is very much visible at this point. I hope you all were able to celebrate the Fourth of July with fireworks, cookouts & all things American. Freedom is an unbelievably great feeling to have, and I'm looking forward to enjoying that feeling even more now. So here's the deal - for two months, I was kind of lame. During recovery, I did a lot of resting, and don't get me wrong, I still am being very conscious of that. But really, I was ready to get the heck out of town and have some fun. Kevin and I are used to constantly being on the go, or "yoloing" if you will. Luckily, the last few weekends have been filled with quick little getaways that have rejuvenated my body and soul! Below are some of my fave pics from my Michigan and NYC trips, and although this past weekend was filled with 12+ hour work days, I was able to see two of my best friends in the world Saturday night, so I'll count that as a successful "getaway" as well! I will surely be clinging to these getaway memories this week. Tomorrow I head back to University of Cincinnati Medical Center for my next and final (and way easier than the last) surgical procedure, my "exchange" surgery. I'll be posting about it later this week once I am back amongst the living and off the pain meds. So today, cheers to enjoying weekend memories & continuing the journey to a happy & healthy life! First up: Our trip to Crystal Lake to celebrate the wonderful matriarch of the McKnight family's 80th birthday! No one deserves a bday bash more than her. Next up: NYC! We took a family trip to celebrate Olivia & Kyle graduating high school and all had a blast. 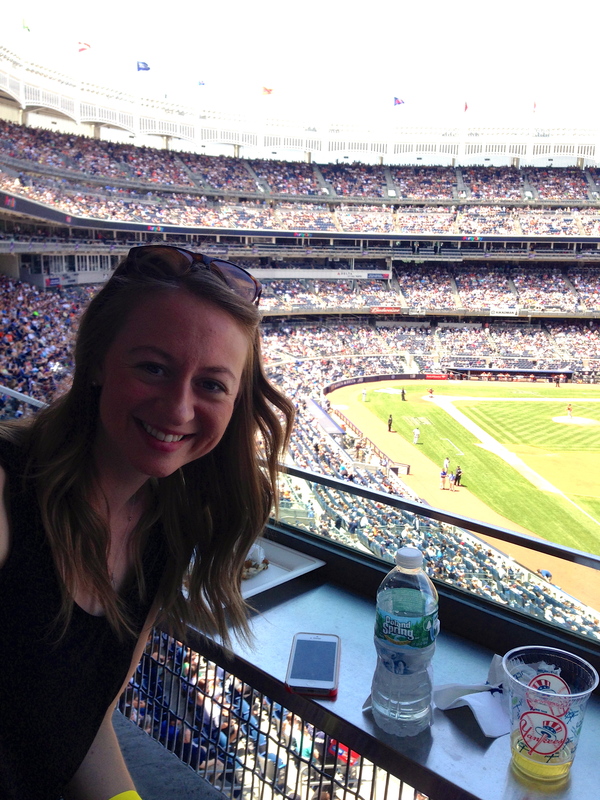 From baseball games, bridal gowns & country concerts, it was a jam-packed weekend in the city. Throughout this journey, there have been many "little things" or moments that have touched my heart. Whether that be a card in the mail from a friend, an evening spent laughing with girlfriends or a song played by the band at Crossroads, I'm very grateful. Today's Throwback Thursday post is about a song called "Oceans" by Hillsong United, and how it followed me throughout the last few months. The story begins a few months back one Sunday morning when I tagged along with two great friends to Crossroads. I admittedly hadn't been making it to church very often now that it's not 2 minutes away from where I live. So Crossroads was a great place holder for me to get my church fix and I was lucky to have friends who would always invite me to join them. This specific Sunday, the band played this awesome song that just spoke to me instantly. There's something about a good contemporary Christian song that just does it for me. When I left church I googled what lyrics I could remember and quickly realized it was a popular song, and even some of my other church-going friends had heard it. I kept jamming to it (loudly) all day (annoying the heck out of Kevin) and by the next week it became my go-to song for when I needed some motivation. Fast forward a few weeks and it's the morning of my surgery. And when I say morning, I mean EARLY morning. My mom and I hopped in the car around 4 or 4:30 a.m. and God bless her she had K-Love on the radio, as usual, and when she turned on the car, there was my song! If that's not a God moment, I don't know what is. As we were grabbing coffee before finding a seat, I was talking about how I had heard "my" song on the way to the hospital a few weeks earlier and was trying to explain to my friend who had yet to hear it how much it moved me. And low and behold, five minutes later, what do they play? The song! Once again, God moment to a T.
The point of this walk down music memory lane is that my faith is something I am proud of, even when I sometimes unknowingly call upon it. God acts in mysterious ways, and sometimes, at least for me, I can find him and his peace in song. So for this awesome new "Jesus music" (you can chuckle) song find, God bless church-going friends, early morning Christian radio and girlfriends who pick you up with green smoothies. P.S. I encourage you to listen to the song. It will not disappoint! As the years go by, it slowly gets easier to use Father's Day for a day of celebration, admiration and honoring my dad’s memory. It may be impossible to put into words how unbelievable he was, but this list and these pictures are a good start. This List in Pics gives you five of the ways I learned to live by Scott Essell's infamous "make good choices" motto. Work hard, play hard My dad's best friend calls anything Patagonia "Scott clothes." It's a fair statement. I was dressed in Patagonia, Birkenstocks and Ray Bans since I was a little tyke. The lesson is not to be a spoiled brat but to take pride in your hard work and splurge on things that make you happy. Whether that's a new pullover, a trip to see San Francisco or a new Apple product, I now can purchase a "Scott" item to treat myself for working hard (after putting some in my savings, too)! Pay attention in school! My dad was smart. I mean, super smart. He had the kind of brain that absorbed everything he came in contact with. So because of that, he’d push Olivia and me to excel in our studies. From sitting me down at the kitchen table and trying endlessly to teach me math equations in junior high, to making sure I was going to my college classes as much as I was going to college parties, he made it clear education was a priority. As I look back now, I remember how excited I would get and how proud I would be to call him and tell him about a good grade I got on a paper or exam. Even when I didn’t realize it at the time, I succeeded because of him pushing me to do my best. How to be a tough guy (girl in my case) Les Mecs Durs (translation: the tough guys) was a phrase plastered on so much cycling paraphernalia in the Essell household. Most people know my dad was an avid cyclist. He started his bike team, Team Nietzsche, in Cincinnati many years ago, and they continue to bike on Thursday mornings to this day. In the last three years of his life, he was truly the toughest guy. He fought so hard for so long, and I am so grateful that he did. During the past few months, I had to be tough as well. I’ve never done well with hospitals, needles, nonetheless surgery. Somehow, some way, I was able to draw on something inside of me to push through, and I know it was him, passing along his toughness. God bless guardian angels. Show affection to those you love One thing I always remember about my dad was whenever he dropped me off at school, volleyball practice, work, etc., he would always give me a kiss before I got out of the car. Always. He showed me how much he loved me every day until the day he died. His memory makes me excited to have my own family and to show my children one day a love that is full and happy and infinite. He’d always sign his cards to me, “D.O.D.” Dear Old Dad. My dad was and still is truly that: so dear. When all else fails, have a margarita My dad even took it a step further by making his own. One of my favorite memories of my dad is his love for Mexican food and good margaritas. We’d look forward to going to Cactus Pear or El Pueblo for fish tacos, and (once I was old enough) making margaritas at home with a big bag of limes and making simple syrup on the stove. I have a funny memory of coming home one day from work, upset about something that now seems silly, and sitting with him in the living room crying and carrying on about stupid drama. After I got a good cry out, he said “let’s make a margarita!” and we went into the kitchen and soon enough I was laughing and the bad day was completely forgotten. Lesson learned: have a margarita and use it as a way to remember him. For those who can spend time with their fathers this Sunday, cherish it! And for those who are remembering their fathers and grandfathers this year, I wish you a day of peace, memories and love. When thinking of which memory I wanted to write about first for this new Throwback Thursday topic, it was obvious to me, but I had a little apprehension I'd embarrass him. Looking back at the last two months, and even the last year or two, there was one person that surprised me. He didn't always jump to say, "Yes, let's 100% do this and do it now! No problem!" but he also never once told me to hold back or re-think my decision. He forced me to have conversations about it, to really talk about how the process would work, what the end result would (hopefully) look like and what OUR, not just my, future would look like. Disclaimer: He has no idea I'm writing this and probably no idea I remember this story enough to write about it (the pain meds and my emotions that day were enough to erase any amount of memory). So as you read this, say a prayer that his face isn't turning the color of his hair. Those of you who know him know he's not a huge fan of spotlight unless it's on the karaoke stage, but even if he never admits it, I know he was secretly loving his two minutes of fame on Channel 5. So this story begins day nine post-surgery, but the real story began just about five years ago. 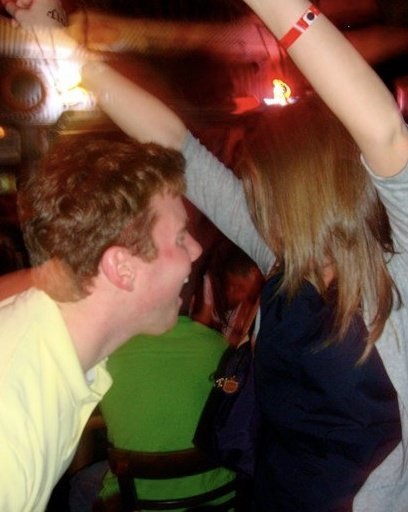 Kevin and I met in college at Ohio University, the "promise land" of the best four years of our lives, and a place that I'll never quite be able to explain to an outsider. We had a little more than two wonderful, crazy years together there and were lucky enough to both call Cincinnati home after graduation. But during all the parties and chaos of college fun, I was also dealing with spirts of challenging times, with my dad's health roller coasting from bad to good, to bad to OK, to the end. Through it all Kevin was there. Giving up weekends senior year to come home with me, skipping out last minute on the Hilton Head Island trip (along with the rest of my amazing friends) to attend the funeral. He truly never left my side. It's because of this that I should have known he'd be the stability I'd need during the decision making process of this surgery, and through the recovery. I was interviewed a few weeks ago on 700WLW about my surgery. There was one question I'll admittedly say that threw me for a loop. "How could your fiancé be OK with a surgery like this, when men are known to be attached to these things?" My answer was simple. It takes a strong man to handle something like this and to support the decision. And I think that strength in him, and our relationship, is what has gotten us through. It was not easy. It was not a simple "let's do this" and move on kind of decision. It took conversations, research and faith to get to where we are today. A lot of people are fascinated by the "engaged couple" part of our story. That here we are planning a wedding while going through this. The truth is I believe we're more capable of planning a wedding now than we would have been otherwise. Conversations about wedding venues, flowers and photographers seem a whole lot easier after discussing mastectomies, doctors, reconstruction and recoveries. I'm blessed beyond belief to have someone like him in my life, for all those supportive and loving qualities. I'm even more lucky that after all the trying times we have been through, especially lately, we've been able to come out on top. It was during my recovery period that I realized how great he would be throughout the rest of my life. It's the little things that surprised me. And it's this little story below, written in these exact words on day nine of my recovery, that I'm so glad I documented so I can remember. And it's this I'll continue to remember throughout the rest of our lives. Day Nine: To remember about this day: asking Kevin to help me replace the band aids and antibiotic ointment on my drain spots and having a sudden emotional breakdown of massive amounts of tears, out of nowhere (probably exhaustion). And returning from blowing my nose in the bathroom, to the couch being completely made into a snuggly bed for my comfort, all thanks to my loving fiancé who I sometimes forget to thank. For his patience, understanding and pure love for me and all the craziness that comes with me. Remember that bed made on the couch. Note: Throwback Thursdays will continue to be an ongoing series, with new posts every other week (on Thursdays, duh.) I want to use these as a way to shed light on my experience, while also showing appreciation to those who got me through it. Maybe some of them will even be humorous :) I hope you enjoy these memories I documented during the preparing for and recovering from my double mastectomy. When it comes down to it, having this surgery in your mid-twenties just isn’t too mainstream yet. You can do as much Googling as you want, but finding good, reliable content isn’t as easy as you’d think. What I really wanted to find was a young, health-conscious chick’s guide to getting through the recovery stage from this surgery while keeping up a healthy lifestyle and mental well-being. So after scouring the Internet for weeks pre-surgery, and now after my own personal experience, here's what I feel compelled to tell you: your recovery will be based on YOU and YOUR body. Don't get down when you're not hitting the gym for the first few months, or be upset when you have a day that you just need to sit on the couch and veg. What's important is to listen to your body. This is a major surgery that requires major recovery. Say you work out twice a week. A few weeks, or a few months if you can, kick it up a notch and do 3-4 nights of cardio at the gym. I've read multiple articles that suggest the better shape you’re in before the surgery, the easier it will be to bounce back after the surgery. This, I absolutely believe, is true. I focused on working out, eating healthy and drinking lots of water pre-surgery, which I think in turn made doing all of the things you’ll read below easier and more of a natural routine. My fave pre-mastectomy workout tip: planks, planks and more planks. I read an awesome article on Bright Pink’s website that said some women work on toning their ab muscles pre-surgery so they can stand in for the chest muscles when necessary. I will say ten times over that the only reason I was able to sit up in the hospital bed was because I could use my stomach muscles. Do the planks. Disclaimer: I took this one very seriously. Prior to my surgery, I had researched the best power foods to stock in the fridge, smoothie recipes to have on hand, and was determined to stick to eating healthy once I was home. I 100% believe that the healthy foods I consumed post-surgery helped me feel better quickly. Plus, it was neat to try new recipes and have some fun with super healthy foods. Faves: quinoa bowls (recipes to come soon! ), green smoothies and the always yummy Greek yogurt with berries, granola and almonds. I’m definitely not saying only eat greens and never eat chocolate (I have to have chocolate or I’d go crazy) but as my mom always says, “everything in moderation.” The healthy eating will pay off and what better of a time to get healthy than when your body needs it most. This one could also seem like a no-brainer, but really resting, especially the first two weeks, really helped in the long-run of my recovery. And I mean resting both physically and mentally. Resting your brain (replacing work emails with cheesy DVDs) was just as helpful as resting my body. It wasn’t that I was doing zero physical activity, it was just knowing when my body needed to rest. I was able to take short walks just a few days after the surgery, but I was smart in also following those walks and bursts of energy with napping, reading wedding mags and catching up on TV shows. It can be easy to want to push it when you’re used to being so active, but your body just went through a whole lot, so the least you can do is listen to it when it’s telling you to take a breather. Need a turn-your-brain-off guilty pleasure DVD suggestion? Two words: Tim. Riggins. You won’t be disappointed. I continue to be in awe every day of the tremendous amount of support I was shown in my decision to have this surgery. From my friends and family who had listened to me talk and worry about this for months, to my coworkers who didn’t find out until I was missing from work, I am so blessed. My mental well-being was uplifted constantly from the kind words and messages I received not only after my surgery but as I planned for it. I think having such a support system and allowing people to help me prepare for it enabled me to go into the surgery day with less anxiety. I knew I would come out on the other side with words of love and encouragement. It wasn’t always easy to tell people about my decision, but I’ve yet to find one person in my life that didn’t react with complete compassion and understanding. I hope anyone that goes through this type of endeavor can know that level of support and use it to fuel their positive preparation and recovery period. Thanks to my BFF, Angelina! One year ago today, Angelina Jolie, most known for her roles in Hollywood movies and for her smokin' hot partner Brad Pitt, wrote an op-ed in the New York Times titled, "My Medical Choice." For those of you who have not read this piece, it details Jolie's decision to have a preventative double mastectomy because of her "faulty" BRCA gene. She explains very clearly that although she is happy that she made this decision, it was not an easy one. How I knew Angelina and I were such BFFs is in her reasoning for then going public about her surgery and process. Simply stated, she says "But I am writing about it now because I hope that other women can benefit from my experience. Cancer is still a word that strikes fear into people’s hearts, producing a deep sense of powerlessness. 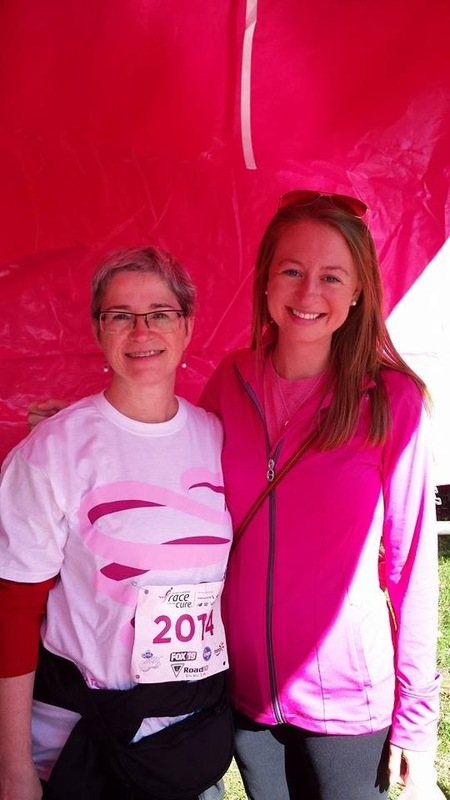 But today it is possible to find out through a blood test whether you are highly susceptible to breast and ovarian cancer, and then take action." Four weeks and two days ago, I had a preventative double mastectomy with immediate reconstruction started at University of Cincinnati Medical Center, by two top-notch surgeons who continue to amaze me. It was because of the same reason Angelina started her journey that led me to mine. In 2009 I had the initial blood test to check if I carried the genetic mutation, after my dad discovered he was a carrier. Since 2009, we lost my INCREDIBLY strong, intelligent and loving father to a disease they could never quite fully understand. What I did not initially grasp was the gift my dad gave me while he was still here to do so: the knowledge that I needed to be proactive and preventative - for my OWN health. Coming to the decision to have this surgery was long and difficult to say the least, but now that I am on the other side of things, and can see the end in sight, I, along with my BFF Angelina, know that it was the right decision for me. So thank you, Angelina, for being cool enough to gain your own slogan, just because of your bravery and courage, and give me an easier way to explain to people what's been going on in my life. I am very, very grateful for that. 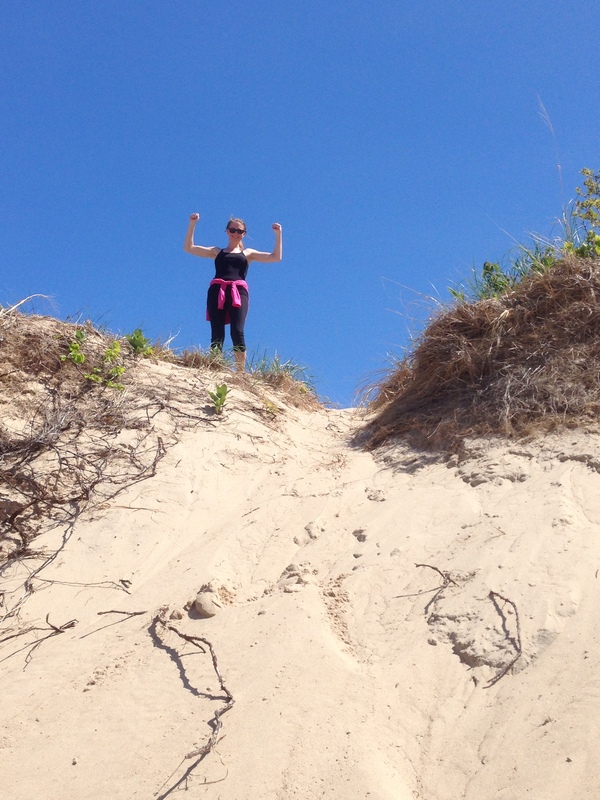 So - I hope this blog can be a place for learning and understanding the life of being at high-risk for breast cancer and ways to live healthy and thrive through life's difficult endeavors, for anyone.